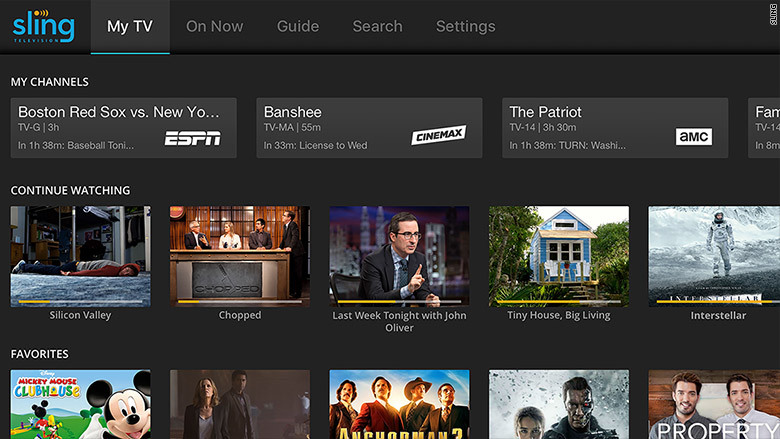 Dish Network is launching its cable-like television service, Sling TV, on Apple TV boxes. Through a unique pact with Apple (AAPL), the service and the hardware will be sold together: The newest Apple TV box will be discounted to $89 when people pre-pay for three months of Sling TV's $20-a-month subscription. The box usually costs $149 and up. Sling TV is a web-friendly version of cable that doesn't require a traditional satellite dish or cable box. It provides a relatively small bundle of cable channels for $20 a month and lets subscribers buy "packs" of additional channels for $5 each. There has been ample speculation about when and whether Apple will launch its own form of streaming TV. Some of its plans have been stymied by complex negotiations with channel owners. Instead, at least for now, it is promoting another company's vision. The Sling TV app announcement was made on stage at Apple's WorldWide Developers Conference in San Francisco. "We're really excited to add Sling TV to the fantastic lineup of Apple TV apps that are ushering in the future of television," Eddy Cue, Apple's senior vice president of Internet software and services, said in an email message. "Apple TV users are going to love being able to choose from Sling TV's great selection of live sports, news and entertainment." Sling TV launched last year. The launch on Apple TV is a pivot point for the company, which is putting a greater emphasis on on-demand programming while still providing a core bundle of live TV channels like ESPN and CNN. Sling is also launching a new user interface on Monday, CEO Roger Lynch said ahead of the announcement at Apple's conference. While Sling TV is already available on other internet-connected TV boxes, like Roku, "Apple TV has always represented the most requested platform since we've launched," chief product officer Ben Weinberger said in an interview. He describes the service as "the first multi-channel, true live TV service on Apple TV." In other words: An appealing prospect for people who want access to the cable bundle, but don't want to pay a company like Comcast or Charter for hundreds of channels. Sling keeps its entry-level price point low by having a core bundle of channels. For example, Sling is adding Viacom's suite of cable channels, like Nickelodeon, MTV, Comedy Central and VH1. But only one of those channels, Comedy Central, will be in the core single-stream $20-a-month service. To watch the rest, subscribers will have to pay for packs of additional channels, which Sling calls "Extra" packs. The Sling TV app will only be available on the most recent version of the Apple TV box, known as the fourth generation box, so it may present a reason for some Apple TV users to upgrade.